So few women are formally trained in Japan as itamae (the Japanese word for chef), it’s turned Yuki Chizui — the country’s first female sushi chef — into a feminist food star. As the manager of the all-female staffed restaurant Nadeshiko Sushi, Yuki is celebrated outside of Japan for challenging patriarchal standards. The Guardian, Food & Wine, Broadly and Eater have all featured her work. But back in Tokyo, she’s still fighting to get the respect she deserves. In her early days as a chef when she would go to shop at Tsukiji Fish Market (where the best chefs in Tokyo buy ingredients), vendors would refuse to sell to her because she was a woman. Male chefs had to purchase fish on her behalf. But Yuki refused to accept defeat. She kept returning to the market until the vendors obliged. “Now I can purchase fish by myself, as a woman,” she says proudly. Earning the respect of fish vendors was a small victory. Yuki has faced discrimination and scepticism throughout her decade-long career. Training to be a sushi chef in Japan is steeped in tradition and formality. According to one chef’s account, an apprentice can spend about five years performing menial tasks at a restaurant before he is even allowed to prepare food. 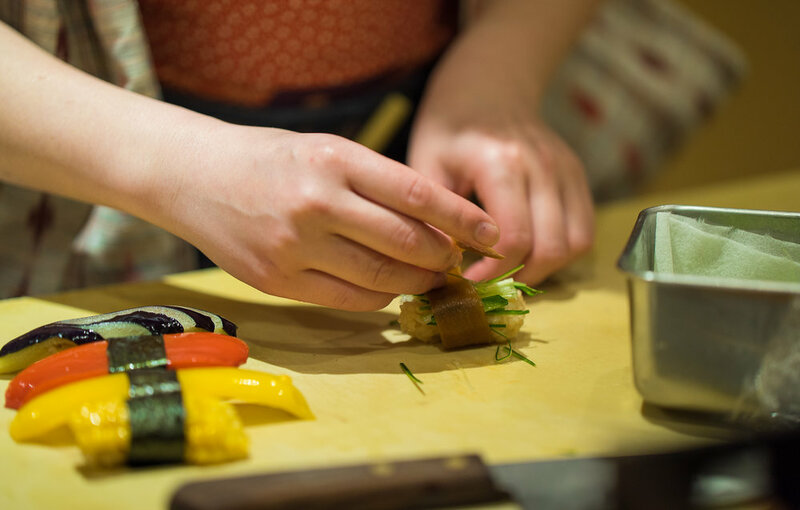 While many women have trained at renowned schools like the Tokyo Sushi Academy, female graduates have difficulty finding apprenticeships at restaurants in Japan. They often pursue employment overseas or learn to cook other types of food, Yuki explains. There are also the ugly myths about how being a woman can inhibit her skills as a chef — how women can’t handle raw fish because their hands are too warm or their perfume will affect their sense of taste. Of course none of these are true — yet Yuki makes a point to say she doesn’t wear perfume or nail polish. Yuki is working to train more women to follow in her footsteps. In addition to hiring female chefs, she recently opened a school to give women the opportunity to learn sushi-making skills. As a restaurant owner, she also tries to do business with other women vendors. But Yuki also acknowledges that Japan needs to change too and become more accepting of women in traditionally male roles in the restaurant industry and society as a whole. The World Economic Forum’s Global Gender Gap index has consistently ranked Japan low — in 2018, Japan appeared 110th out of 149 countries. Even though more women are entering the workforce, they often run up against long-held patriarchal norms later in their careers that limit opportunities for advancement. Hopefully people inside Japan will start to listen to her message, too. This piece is also available in Japanese.